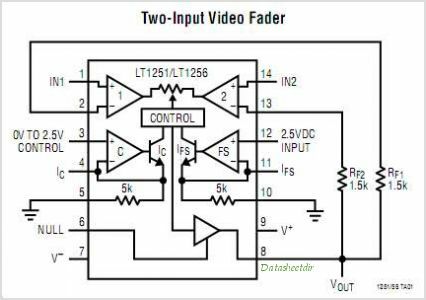 The LT1251 LT1256 are 2-input, 1-output, 40MHz Current Feedback Amplifiers with a linear control circuit that sets the amount each input contributes to the output. These parts make excellent electronically controlled Variable Gain Amplifiers Filters mixers and faders. The only external components required are the power supply bypass capacitors and the feedback resistors. Both parts operate on supplies from 2.5V (or single 5V) to 15V (or single 30V). Absolute gain accuracy is trimmed at wafer sort to minimize part-to-part variations. The circuit is completely temperature compensated. The LT1251 includes circuitry that eliminates the need for accurate control signals around zero and full scale. For control signals of less than 2% or greater than 98%, the LT1251 sets one input completely off and the other completely on. This is ideal for fader applications because it eliminates off-channel feedthrough due to offset or gain errors in the control signals. The LT1256 does not have this on/off feature and operates linearly over the complete control range. The LT1256 is recommended for applications requiring more than 20dB of linear control range. This is one package pinout of LT1256,If you need more pinouts please download LT1256's pdf datasheet. 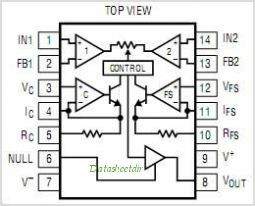 This is one application circuit of LT1256,If you need more circuits,please download LT1256's pdf datasheet.